The Plot: 1929. 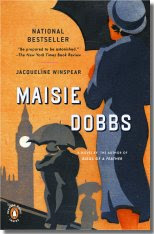 Maisie Dobbs opens up her own London office as a Private Investigator. Her first client -- someone who wants to find out if his wife is cheating on him. Maisie, thinking of her education, background, and training, internally sighs at how mundane this is but takes the case. Nothing is what it appears to be, however. Maisie is not an upper class woman, despite her accent, bearing and education; and this, her first solo case, is about people and a country haunted by the Great War. The Good: I've heard great things about the Maisie Dobbs books forever but just got inspired to make time for them. ListenNJ.com has audiobooks for the iPod, so it seemed like a good idea to read a book I wanted to and play with the downloading. Love this series! Now I have to carve out time to read the rest of the books in this brilliant series. Who is Maisie? A working class girl who was in the Downstairs world, that slipped into the Upstairs life based on education and drive. Part of the mystery of this first book is finding out exactly how that happened. It's not linear; we begin in 1929 with the investigation, get some clues into Maisie's life, then slip back to 1910 and a young teenager who has lost her mother and been put into service because it's the best her father can do for her. Long story short, her employers realize her potential and she ultimately ends up going on to Cambridge. With the entry of England into the Great War, Maisie interrupts her education to become a nurse. Maisie's backstory is fascinating; and the Great War shadows everything. It matures Maisie; and it changes the society she lives in. Her Downstairs/Upstairs background, combined with her own war experiences, and her education and training, create a uniquely talented investigator with great insights into motivation. The mystery was well told; Maisie's investigation was interesting; the various characters were nuanced; and I'm looking forward to reading more in this series. I had one quibble with the book; but with a series, it may be something that is addressed later. It also may well be that my issue isn't with the book, but with the realistic burdens and challenges Maisie faces. As a teen, Maisie has to be twice as good as everyone about her and this isn't recognized in the book. Yes, an education is provided but she still has to perform her full workload as a maid. So, she has to work full time PLUS pursue knowledge; and in that education she has to show herself to be twice as dedicated and smart as any upper class teenager, because she is studying while working full time. When it seems like Maisie is overwhelmed, the book diagnoses the problem not the dual workload but rather the pressure of navigating between two classes. While I don't doubt the truth of the class issues, particularly for this time period, on Maisie's behalf I wanted someone to recognize she had to be twice as dedicated as the next person to achieve what she did. Downloading review: Overall, it took much longer than I'd anticipated. The actual download had to be done twice because it didn't all download correctly the first time; then it turned out I had the wrong application OverDrive media console; and then it took a very long time to transfer to my iPod. The iPod mini worked OK for listening to the book; the main drawback was that halfway thru, I turned it on to find out it hadn't saved my place and I had to figure out where I was. I'm not sure if this was all human error (and wireless) or typical. Good to hear you enjoyed this. I've read the first three in the series so far. I find them to be a nice enjoyable break. Good stories, a bit of a gentle pace and an interesting time period. I've never listened to them, but it sounds like the audio version was good. Might have to consider audio for one or more of these. I love Maisie. Glad that you enjoyed the first one (and good to know that it holds up well as an audio). I think that the series just gets better. I liked the first Maisie Dobbs book, but I didn't find the second and third to be as good. I love that historical period, but I've yet to find a "new" mystery series (vs. one written back in the nineteen thirties or earlier)that works for me. I had so much fun reading this, as well. Have you ever seen the TV show Jeeves & Wooster? Same time period. Less class issues, though. But more outright humor. Steven Fry & Hugh Laurie star. I had a much easier experience downloading audio with Overdrive - very quick for me to download & transfer to my MP3 player. But I also had trouble with marking my place - I had to manually bookmark it, or it would start at the beginning again. I've heard that iPods do this automatically, so I'm interested to hear if you have luck figuring this out. Can you write about if you have better experience with ListenNJ next time? thanks!